Free-motion quilting is the technique that allows you to quilt in any direction without turning the fabric. 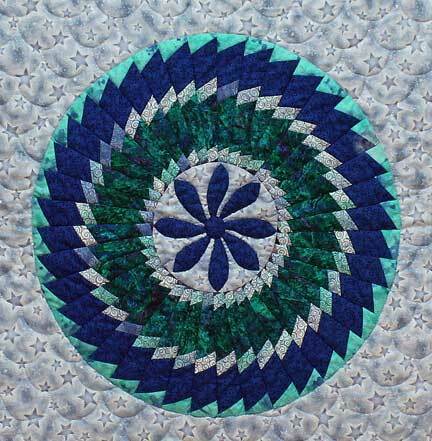 Free-motion quilting enables you to quilt elaborate designs such as feathers, curves and out line appliqué shapes. It opens up a whole new world, it is fun but does need practice. When free-motion quilting use a darning foot and always drop or cover the feed dogs. The feed dogs control the stitch length, so when they are dropped or covered you are responsible for determining the stitch length. The stitch length is determined by how fast you move your fabric and the speed at which you run your machine. Try and maintain a constant speed while you are sewing, the faster you move your fabric the longer the stitch length, the slower you move the fabric the shorter the stitch length. Your aim is to develop a rhythm so your stitches are relatively even in length and you can make smooth curves and lines as you draw with your needle. Secure your threads when you begin free-motion quilting, this is done by bringing the bobbin thread through to the top and then hold on to both threads ready to start sewing. The threads are secured with tiny stitches so run your machine fast while moving the fabric very slowly. When you have finished quilting a design finish off with ¼” of tiny stitches. Imagining your needle is a pencil try and maintain an even speed and controlled motion as you sew. To start with move your fabric backward and forward and then side to side. See your stitching line as a continuous doodle and needle as a pencil draw wiggly lines, squares triangles, write your name, the list is endless you are only limited by your imagination. Practice in this manner until you feel confident and controlled.